Beautifully engraved certificate from the United States Leather Company issued prior to 1944. This historic document was printed by the American Banknote Company and has an ornate border around it with a vignette of an allegorical man and woman sitting on both sides of a picture of a Steer. This item has the printed signatures of the company�s president and secretary and is over 73 years old. This company was part of the 12 original Dow Average Companies of 1896 and is very hard to find. - American Cotton Oil Company, a distant ancestor of Bestfoods, now part of Unilever. - American Sugar Company, now Domino Foods, Inc.
- American Tobacco Company, broken up in a 1911 antitrust action. - Chicago Gas Company, bought by Peoples Gas Light in 1897, now an operating subsidiary of Integrys Energy Group. - Distilling & Cattle Feeding Company, now Millennium Chemicals, a division of LyondellBasell, now in Chapter 11 bankruptcy. - Laclede Gas Company, still in operation as the Laclede Group, Inc., removed from the Dow Jones Industrial Average in 1899. - National Lead Company, now NL Industries, removed from the Dow Jones Industrial Average in 1916. - North American Company, an electric utility holding company, broken up by the U.S. Securities and Exchange Commission (SEC) in 1946. - Tennessee Coal, Iron and Railroad Company in Birmingham, Alabama, bought by U.S. Steel in 1907. 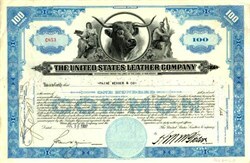 - U.S. Leather Company, dissolved in 1952. - United States Rubber Company, changed its name to Uniroyal in 1961, merged with private B.F. Goodrich in 1986, bought by Michelin in 1990. When it was first published, the index stood at 40.94, but ended up hitting its all-time low of 28.48 during the summer of 1896. Many of the biggest percentage price moves in the Dow occurred early in its history, as the nascent industrial economy matured.